The Last Supper painting certainly had its fair share of limelight in our recent times, with most of the attention being showered because of its seemingly ‘cryptic’ nature as opposed to pure history. However, this time around, things have moved beyond the ambit of the mural, to account for what actually was on the menu for the last supper of Jesus Christ. To that end, two Italian archaeologists – Generoso Urciuoli and Marta Berogno have painstakingly went through a myriad sources, including Biblical verses, ancient Jewish texts and even Roman authored works to determine the then-contemporary cuisine of Palestine/Levant, and how it might have featured in the ‘last supper’. And as a result, they have found that the most likely items on the menu would have pertained to – a bean stew, a lamb preparation, olives, bitter herbs, a special fish sauce, unleavened bread, dates and a variety of aromatic wine. Leonardo’s mural derives from centuries of iconographic codes. Embodying the sacrament of the eucharist, the Last Supper has a very strong symbolic meaning and this does not help the historical reconstruction. Now of course, actual history goes beyond symbolism – and for that, the archaeologists had to revert to older paintings dating from around 3rd century AD. The search related to a range of sources, including even catacomb murals that are around 2,000 years old. They had also closely analysed the New Testament passages that describe the then Jewish meals in two separate incidents – the Wedding at Cana (where the famed miracle of water turning into wine was achieved), and Herod’s Banquet (where John the Baptist was martyred). In terms of historical significance, these two incidents shed some interesting insights into the Levant populace’s eating habits, with the ‘wedding’ alluding to how the Jewish people maintained their dietary laws, and the ‘banquet’ hinting at the Roman influence on the Levant cuisine. 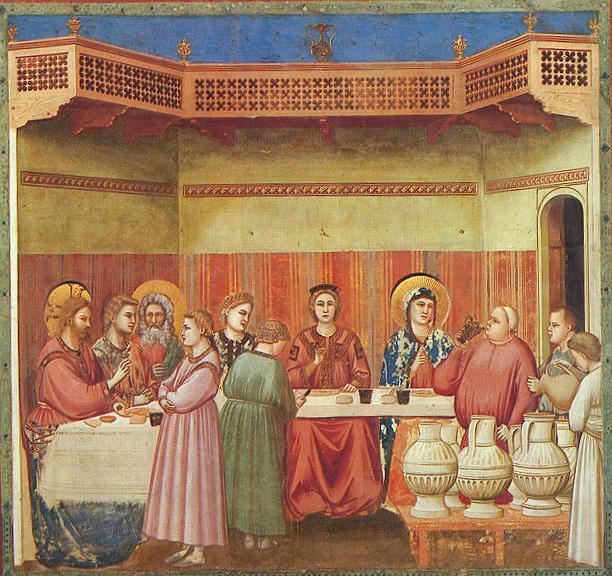 Marriage at Cana by Giotto. 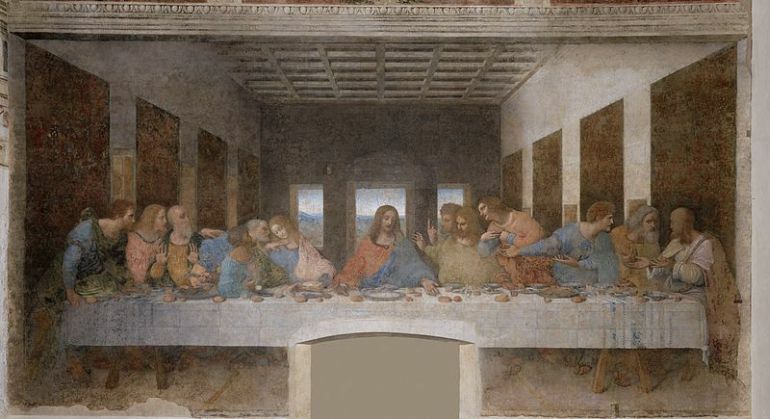 The assessment of such variant studies and writings have provided the researchers with credible notions about the food being served during the ‘last supper’. In that regard, the aforementioned Roman influence is evident from a dish called tzir, which is inspired by the Roman fish sauce garum. On the other hand, the menu might have also included cholent, a stewed dish of beans cooked slowly over fire and served during festivities. As for the Passover influence, it may have been dictated by the bitter herbs and charoset – a plump fruit and nut paste. The historical scope is however not just limited to the food items in question here; it also relates to the setting of the ‘last supper’. To that end, once again da Vinci’s depiction would have been out-of-place, since in ancient Palestine food was served and eaten around a low table, with guests sitting on carpets or cushions (as opposed to in chairs around a rectangular table). The utensils and bowls would have also pertained to stone-made products or (Roman influenced) terra sigillata pottery. And lastly, back then, people did follow the ‘politesse’ of sharing food from a common container – as Judas did from Jesus’s bowl. 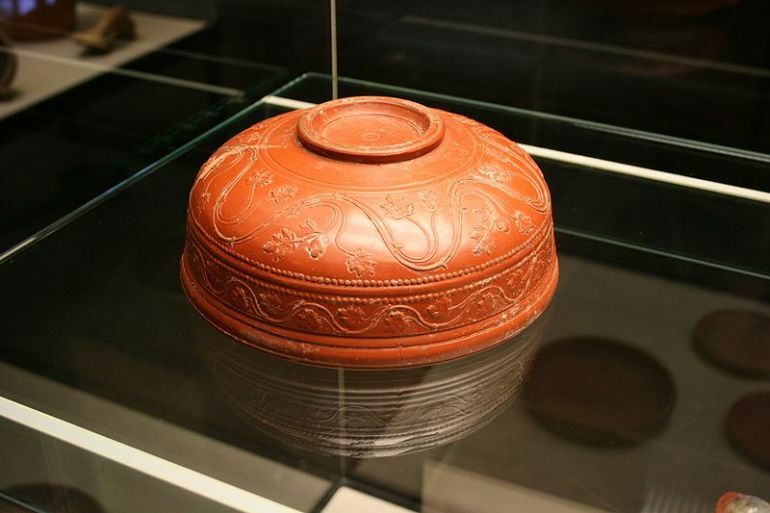 Roman red gloss terra sigillata bowl with relief decoration.